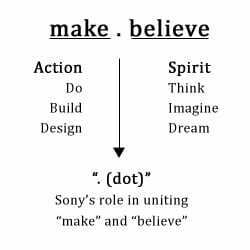 Berlin, Germany, September 2, 2009 - Sony Corporation (Sony) today announced "make.believe" (make dot believe), a new Group-wide brand message that unites Sony's communication initiatives across electronics, games, movies, music, mobile phones and network services. The introduction of "make.believe" symbolizes Sony's spirit of creativity and innovation and marks the first time the Company has introduced a unified brand message encompassing both entertainment and electronics. "As we move to transform Sony and integrate the very best in electronics, entertainment and technology into the homes of our customers, the importance of an all-encompassing and unified brand image is more important than ever," said Sir Howard Stringer, Chairman, CEO and President, Sony Corporation. "In addition to reigniting the innovative spirit of our employees and our products, 'make.believe' will differentiate us from countless competitors and inspire consumers around the world to embrace all that is Sony." Over the coming months, "make.believe" will begin to appear in Sony advertising, promotional materials, sports sponsorship, product packaging, retail outlets, online content and more in a phased roll-out across the globe, beginning with IFA in Berlin and culminating with its North American debut at CES in January 2010. At a press conference held in Berlin, Germany, Sony also announced examples of how "make.believe" translates into products and services, including the scheduled launch of 3D hardware and content for use in the home from 2010, and the introduction to key European markets of the PlayStation®Network video delivery service, which Sony has already launched in the U.S. market. Sony's diverse range of businesses extends from electronics hardware including professional and consumer products to entertainment such as movies, music, and games, as well as network services such as PlayStation Network. By aligning all its external communication efforts and delivering a consistent, unified message to consumers, Sony will seek to enhance the strength and reach of its brand across countries and cultures, and continue to change how people experience the world through its full spectrum of products and services.